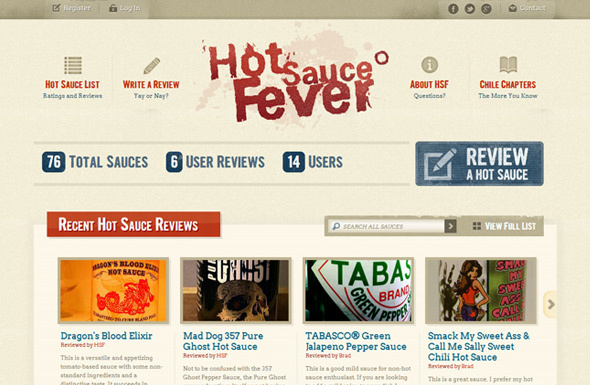 Hot Sauce Fever is a personal project to create a definitive reference list of hot sauces, that anyone can rate and review. The idea was born when I started looking for a site like this, expecting that it already existed, as it does for beer and wine. When I didn’t find anything, I decided to make it happen, with the help of designer Danny Day. I ended up choosing the Yii PHP Framework, seeing that it was gaining a lot of traction lately, and was a useful learning tool for a proper MVC (Model-View-Controller) structure. The is a fully responsive fluid-width site, with breakpoints dependent on both the design and resolutions. It was built desktop-first, rather than the mobile-first. During the initial build, I kept in mind how it was going to have to change at smaller widths. For example, the 4 main navigation buttons around the logo were made a single list, with spacing applied to the 2nd and 3rd list items, knowing that they would have to push down. Perhaps you could call this planned-retrofit responsive design. This approach, without a specifically designed mobile or iPad-sized design, worked fine in this case, since I was the client.